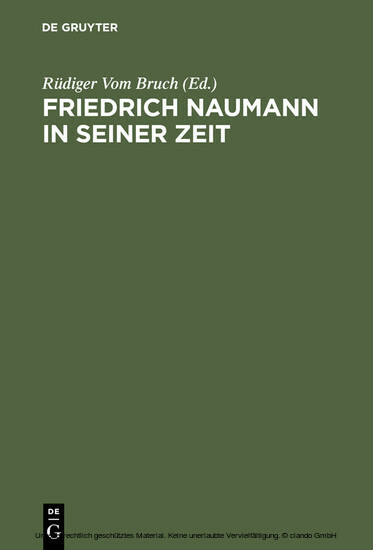 Papers on the different phases in the life and work of the social-liberal pastor, publicist and politician Friedrich Naumann. Re-visiting Friedrich Naumann in his own age promises an exciting experience in the encounter with an extraordinarily fascinating character from the later years of the Second Empire; he focuses manifold currents of the age in their striving for modernity and renewal. With his sure command of language, Naumann found memorable formulations for the demands for reform which he represented. The volume contains papers by historians and theologians dealing with the following complex topics: The will to shape politics as a Christian responsibility ? Social liberalism in an organised world ? Capitalism and liberalism in cultural discourse ? Transformations in the Great War and the Weimar Republic ? Work and influence.